Grandad's Awesome Book Of Notes, Lists & Ideas: Featuring brain teasers & puzzles! Does Grandad make a habit of leaving notes and important information on multiple pieces of paper? Does he also enjoy keeping his brain active and tackling a daily puzzle? Here is the perfect solution! 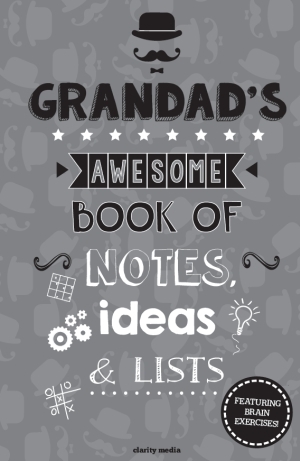 Grandad�s book of all things awesome is packed with fun and challenging puzzles as well as plenty of writing space, great for making those daily lists or jotting down brilliant ideas! With over 100 pages there will be no shortage of space! Featuring over 45 brilliant brain teasers such as the classic sudoku, wordwheel, number pyramids and kings journey, Grandad is sure to enjoy tackling our awesome collection of puzzles when making notes. All puzzles are complete with solutions towards the back of the book so if you are unsure or need a little inspiration, take a look there. Good luck and happy solving! Is Grandad a fan of sudoku? Perfect! This book features a great range of mixed puzzles, including plenty of sudokus to keep Grandad busy for hours. Here's a few tips and rules for Sudoku so that Grandad can get clued up before he tackles the puzzles in this book! - Look at sets of squares that must contain numbers: for instance if three squares in a region have as candidates 15,125,25 then the numbers 1, 2 and 5 can be removed as candidates from all other squares in the region because you know that these three squares must contain the 1, 2, and 5 in some combination or other. 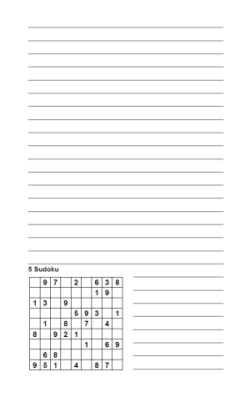 Using these rules you will be able to solve the puzzles in this enjoyable collection - of course there are other rules you can use too, but you won't need more than these to solve the sudoku puzzles in this collection.